"I have never seen such a large, diverse crowd so completely awe-struck by any clown before!" Buddy performs either a variety or western show. Juggling, Unicycling, Magic, Cigar Boxes, Balloon Animals, Trick Roping, Funny Fiddle, Trick Bike, Harmonica, Wire Walking, Plate Spinning, A Skateboard Act, Balancing Acts, Lots of Jokes, Improv, and Audience Participation (as appropriate to circumstances). 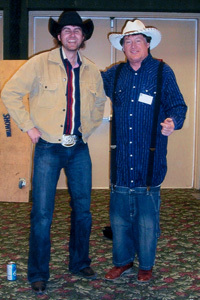 Also available for Roving, Workshops, Lectures and Trick Roping dressed as a cowboy. from boardrooms to birthdays, stage shows, and more. Good clean fun customized to event. "We look forward to working with Buddy again." Buddy was once a cub pack leader. "Excellent show, good rapport with both kids and adults"
"Buddy was a big hit at my son's fifth birthday and later at my sister's fiftieth." "Buddy knows how to make people laugh." "Buddy's interaction with the children and adults made for a wonderful performance." A unique combination of stand-up comedy, skill, and audience participation. "Buddy entertains at copious corporate affairs." "Buddy is a complete entertainment package for young and old." Have Buddy perform a show for your next event. Call with details and he'll customize a show to fit your needs. "Buddy was interactive and fun." "The children and their parents really enjoyed Buddy's shows." New Year's, Children's, Canada Day, and others. Stage Shows, Workshops, and Roving. "Buddy was a big hit." Special Events, Brunches. Shows and/or Roving Table to Table. Buddy has many repeat customers. "Thanks, Buddy, for your enjoyable performances." Since 1985 Buddy has been a regular visitor at the Alberta Children's Hospital in Calgary. He also tries to visit hospitals and seniors' homes when he is out of town performing. 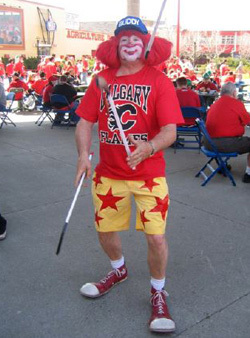 Buddy has lectured at the Calgary Teachers' Convention twice as well as the Olds Teachers Convention, for doctors at the Calgary General Hospital, and at Laugh Makers Variety Arts School in New York State. "Buddy has exhibited kindness and sensitivity towards the children and has a unique talent... much appreciated by the Alberta Children's Hospital." "On behalf of the community of La Crete, which has a majority Christian population, we commend Buddy for his wholesome performances." Educational program "Who's your buddy?" deals with peer pressure. "Buddy has a sound show and exhibits considerable skills." "Buddy was really enjoyed by both our patients and staff." 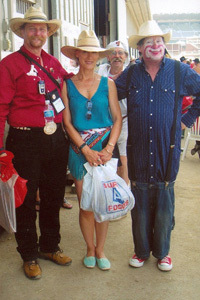 Buddy has performed at many shopping centres including West Edmonton Mall and 42 shows at various shopping centres for the Calgary Stampede. "There is no buddy better." 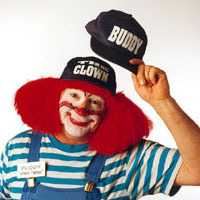 "Buddy is the entertainer of choice. Both the adults and the children were in stitches." The Buck Shot Show, The Paul Hann Show, and others. Buddy has had many repeat appearances. "We got a terrific response from having Buddy on our show (even more than the premier of Manitoba's appearance!)" Stage Shows, Roving, Fiddle Contests, and can even do a show for the exhibitors. "Buddy provided our community with a top quality act at a reasonable price." 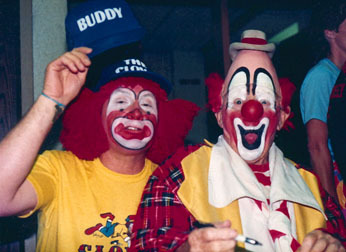 "Buddy's sense of humor and antics entertained both young and old alike." 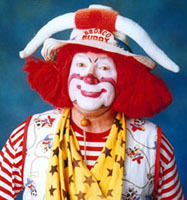 Buddy has years of experience teaching clowning to children and adults. 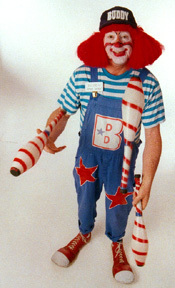 Buddy has offered an eight-lesson clown course for children ages 8 to 12 through the Calgary Board of Continuing Education. 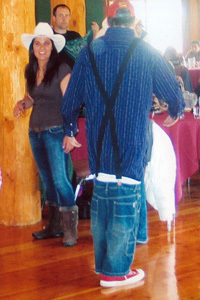 He also has taught juggling as well as wire-walking, rope-spinning, and other circus skills. "Buddy possesses unique qualities, his professional approach to teaching and dealing with children has made him a valued member of our teaching team." 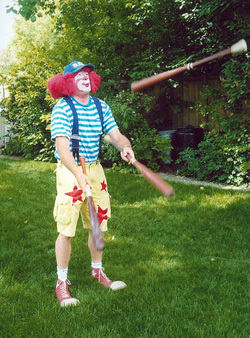 The baseball bats are very hard to juggle! 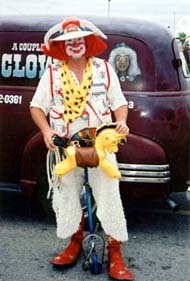 "Buddy was way better than the other clowns and magician." The brand new 'Mr. Funny Pants' himself (Sponge Bud Short Pants)! Buddy is also available for lots of other types of events. "Buddy has a great sense of humour, and he interacted well with our employees."